Manila, Philippines - President Benigno 'PNoy' S. Aquino III will deliver on Monday, July 28, 2014 his 5th State of the Nation Address (SONA) before the second regular session of the 16th Congress at the Batasan Pambansa, Quezon City. The fifth SONA of the President is expected to highlight the accomplishments of various departments of the government and the results of his promises during SONA 2013. According to reports, PNoy's speech will focus mainly on the government's good governance and anti-corruption campaigns. Malacanang said on Sunday, July 20 that Aquino may base his SONA on his previous speeches, specifically on how the administration was able to bring reforms to the economic front. Coloma added that Aquino will also lay out his plans for the last remaining years of his administration, including those in relation to the campaign against graft and corruption. Coloma said that the issue on the Priority Development Assistance Fund (PDAF) will be discussed. In addition, it is expected that PNoy will explain and defend again his Disbursement Acceleration Program (DAP) , how it was able to benefit Filipinos. 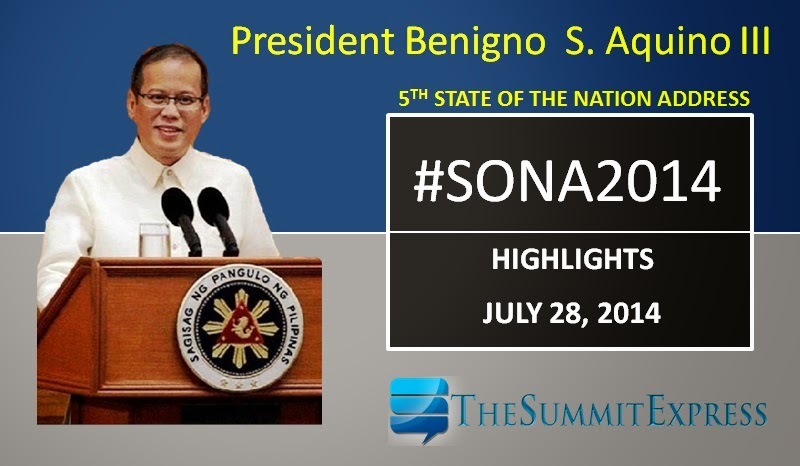 SONA 2014 in general highlights different aspects of the nation - economy, jobs, asset reform, education, sports, government and ethics, health and environment, tourism, justice, urban poor, issues in Mindanao, foreign affairs and national security. Aquino's speech report last year was the longest SONA so far but has been applauded less frequently compared to previous years.